Synesthesia is the phenomenon of cross-stimulating senses (associations of tastes with colors, colors with sounds, etc..). By implementing a programmable (via a simple serial cable) CV to DMX interface, you can connect to your modular any DMX lighting fixture (like rgb projectors, moving heads, strobo lights, smoke machines, etc..) and drive up to five parameters with control voltages. In the demo we made (and as a default) the module will pilot a DMX lighting fixture by varying the RED, GREEN, BLUE, DIMMER and SHUTTER channels. Holy sweet lord, this rules. My finances are now officially fucked! not sure if i want to invest in a bunch of dmx gear at this point. but if i already had some then this would be a no-brainer. August or September we will sell this! Oh, and those modules will be distributed in the US by AnalogHaven and Control!, in Australia by EquinoxOz and directly by us in Europe. Actually a little refinement at the firmware and the steel panel prototype is on order. We hope to start the production in a month! I'm definitely interested in giving it a try. Oh cruel boy! Don't you see we need it? Don't you see we love it? SY1 and UL1 are IN STOCK for the european guys and soon in the US through distributors! 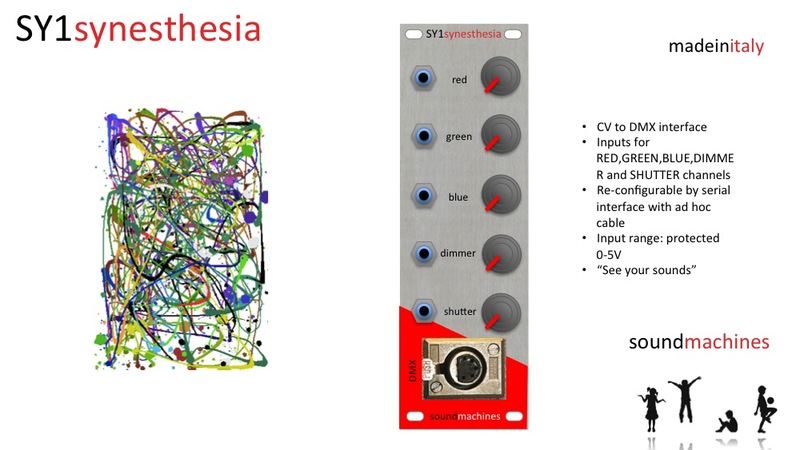 So, SY1synesthesia (along with UL1 and the other modules) is in stock!! you can by it immediately from our site or POSTMODULAR UK in Europe and soon from AnalogueHeaven, MEMEAntenna and CTRLVOLTAGE in the US!! Thread revive... Anybody using it? I'm interested in one.. Please let me know if you need some particular info or demos, etc..! Thanks for the reply. I'm very curious to see some demos! What I want to do is control something like simple a 230v dimmer with CV sources, but I'm very inexperienced with dmx. 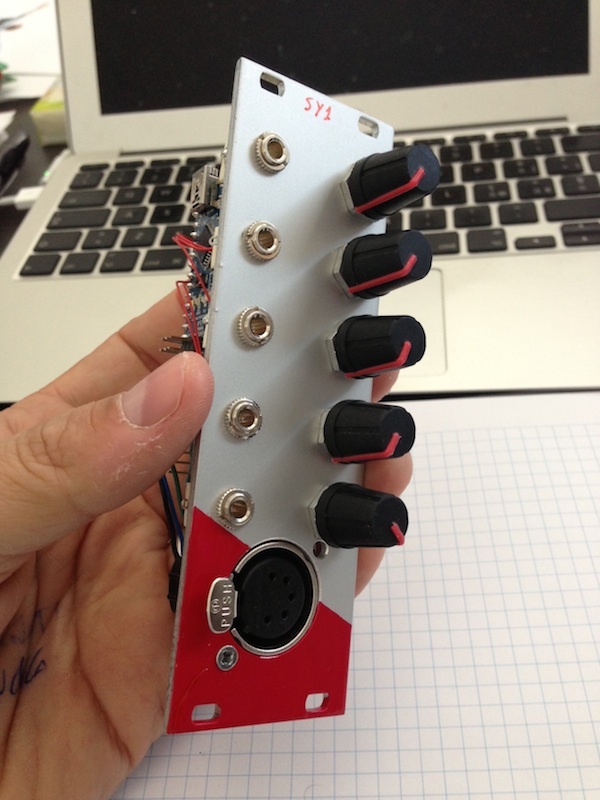 Would like to see how other musicians use this module and what kind of other dmx hardware is involved. All info and ideas are welcome really. Dont' know if you already had a look at this video, it shows everything you need to know! What you are saying is perfectly suited to the SY1... and much more! What's the current draw and depth? Does it need to be initialized or c an I use it right out the box? Hello there! Sorry for the delay! The module is pre-configured with a pretty standard config (the first 5 DMX channel mapped to the 5CV in and POTs. The product include a USB to UART interface to configure it via a terminal program, so it's pretty straightforward once that you have the DMX mapping of the lighting fixture. consumption on +12V is 50mA. Please take a look at the manual, is downloadable from the product's page on the website!